Camp Oregon Caves Civilian Conservation Corps facility showing the heritage tree when it was showcased on the facility grounds as a landscape tree. Photo taken around 1940. Illinois Valley Newspaper archives. The Camp Oregon Caves Port Orford Cedar was situated in the center of the parade grounds of Camp Oregon Caves Civilian Conservation Corps facility, which was in operation from 1934 to 1941. The buildings were torn down years ago and the tree helps to mark the locations of the historic buildings. Note that this heritage trees recently died. It has been left standing along with the heritage tree marker to serve as a reference point for locating buildings in these historic images. The site of Camp Oregon Caves is located on Highway 46 (Oregon Caves Highway) about 11.5 miles from Cave Junction and about a quarter of a mile past the entrance to Grayback Campground. The most distinctive landmark is the historic Grayback Guard Station (sometimes called the Cedar Guard Station) on the left side of the road. 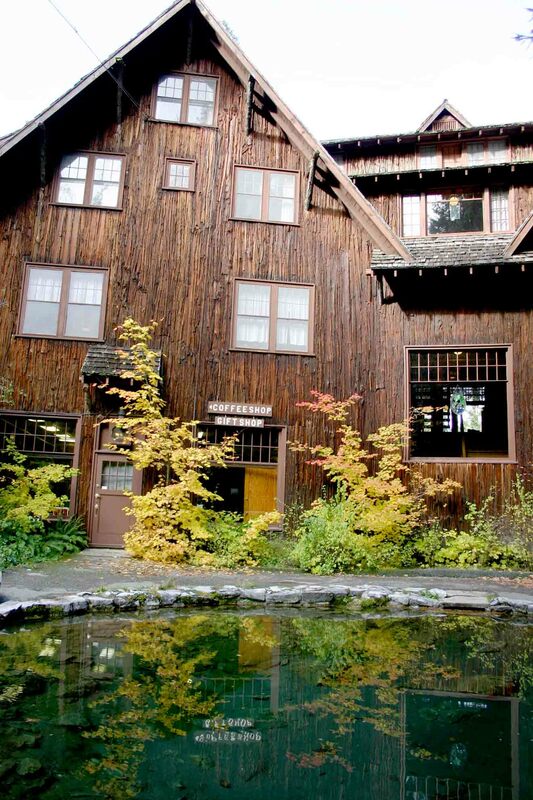 The exterior of this building is covered with the bark of the Port Orford cedar, a durable exterior covering used on buildings during the Great Depression. The marker on the map indicates the location of the Cedar Guard Station. 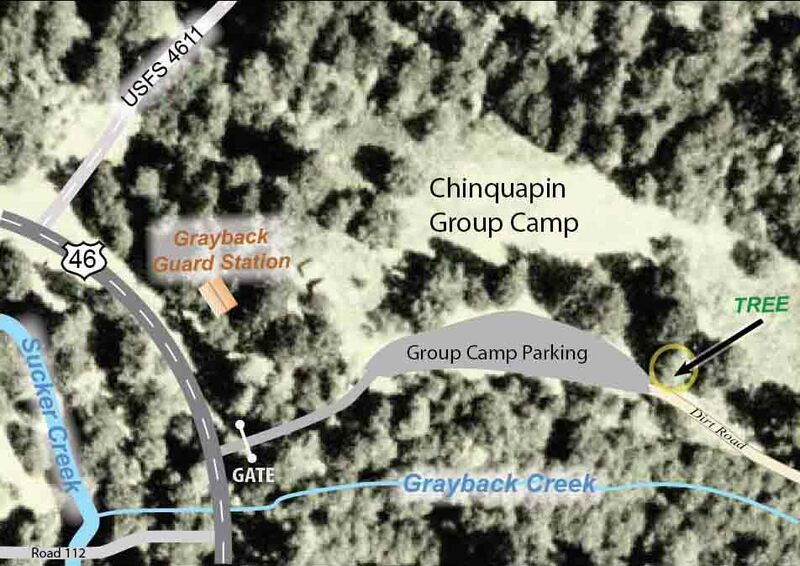 A few yards past this building is the paved entrance to Chinquapin (chin-kah-pin) Group Camp where a gate blocks access into the group camp area. The heritage tree is at the back of the group parking area. The Camp Oregon Caves Heritage Tree is indicated with a yellow circle on the right side of the map. The cedar siding of the Oregon Caves Chateau is a distinctive architectural characteristic of the Civilian Conservation Corps era. The Camp Oregon Caves Heritage Tree was situated in the parade grounds of Camp Oregon Caves, a Civilian Conservation Corps facility that was in operation from 1933-1941 and was located about eight miles from Oregon Caves National Monument. During this period two hundred youth were stationed at this facility and worked on projects in this region during the winter and transferred to Crater Lake National Park during the summer. The camp closed when World War Two began and, during that time, when building material was scarce, many of the buildings were dismantled and the wood carried away to be used for construction elsewhere. The only structure remaining at the camp is the Grayback Guard Station, a small cabin adjacent to Highway 46 and about 200 feet from the heritage tree. The Port Orford cedar was nominated for the Oregon State Heritage Tree program because of the significance of this tree to the architecture of historic buildings in this region, especially on the exterior of the historic buildings at Oregon Caves. The wood is also resistant to splintering, which made it the ideal material for arrow shafts and was one of the reasons that the primary sources of arrowshafts was this region, the only place in the world where this tree grows.